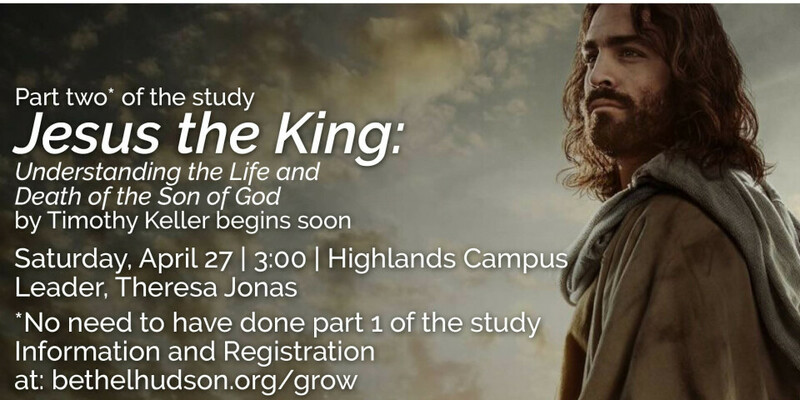 Part 2 of the study based on the book, Jesus the King: Understanding the Life and Death of the Son of God, by Timothy Keller will begin on Saturday, April 27th at 3:00 at Highlands. All are welcome to join the group whether you participated in part one of the study or if you'd like to jump in to part 2 of the discussion/study. Part 2 of this study will take 6-8 weeks. For those who already have the book there is no fee, but please register using the link below. New participants may register and order the book (fee: $12) using the link below.